It's November in downtown Chicago. The local political machine is in full swing; corrupt elected officials sit in the pockets of powerful businessmen. Following a major economic recession, unemployment runs rampant. Immigrants in the workforce, fearful of losing the positions they have, struggle with illiteracy, constant poverty, and appalling living conditions. Then a deadly epidemic sweeps through the city, overwhelming health care workers and hitting young people especially hard. The year is 1893. Miss Emily Cabot, a native Bostonian, has been kicked out of her sociology graduate program at the University of Chicago -- not for academic reasons, but because of a social disgrace. The Dean of Women gives Emily a chance to redeem herself by securing a position for her at Hull House, the settlement founded by Jane Addams in the heart of the city's West Side. Devastated by the loss of her fellowship, Emily is grateful for the opportunity, though she's skeptical about Hull House's practical, hands-on approach to solving the immigrant community's problems. As Emily quickly gets absorbed into the day-to-day tasks of the settlement, her eyes are opened to a different world. Along with Florence Kelley, Chief Inspector of Factories for the state, she visits manufacturing establishments to ensure they're following a new law that limits female workers to eight-hour days. They meet resistance from all avenues, including from the workers themselves. Then, on Christmas morning, while nearly everyone is at church, a man representing the interests of a sweatshop owner is found bludgeoned to death in the Hull House parlor. Because Mr. Hanrahan had connections to their late father, Emily's brother Alden thinks he was killed to prevent him from revealing his knowledge about Judge Cabot's own murder back in Boston. Emily and Alden pursue separate investigations, as do the local police, and their differing conclusions complicate matters and draw innocent bystanders into the fray. The Hull House residents, while widely respected in Chicago society, risk losing their good reputation if one of their own is accused of murder. Meanwhile, attendance at their classes and clubs for European immigrants has dwindled due to the smallpox epidemic. Emily finds herself assisting in situations she never learned about in school, like convincing nervous mothers about the safety of vaccinations and laying out disease-ridden bodies for burial. 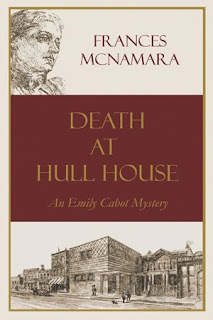 This fast-paced, enjoyable historical mystery does an excellent job plunging readers into the hubbub of activities at Hull House and the chaos resulting from the spread of smallpox. There's a lot going on at once, but the many plot threads are laid out cleanly. The dialogue is slightly formal, and the secondary characters from Alden to Emily's doctor friend to Jane Addams herself are generally well-rendered. Although Emily's personality comes through strongly on page one, her friends and associates often outshine her; it would have been nice to get to know her a little better. There are some copyediting errors, but they become less noticeable as the story continues. This is second in a series (after Death at the Fair), and with many references to earlier events, the books may be best read in order. Not all the subplots end happily, which reflects the reality of this place and time. Readers should come away from Death at Hull House with newfound respect for the women social reformers of the late 19th century, and the difficulties they faced creating a bridge between the two halves of Chicago society. Death at Hull House is published on December 1st by Allium Press of Chicago at $14.99 (pb, 261pp, 978-0-9840676-0-2). Thank you for this review. I am always interested in historicals with a Chicago connection. Also, those with a St. Louis connection, but those seem to be few and very far between. I so appreciate your blog. I've discovered some wonderful reads and exciting new and not-so-new authors. Thank you! Thanks for the review Sarah. I too am interested in historicals set in Chicago. Thanks for your comments, Betty and Elizabeth! I find myself visiting Chicago pretty often since it's a short drive from here, and reading historical fiction set there gives me a better sense of its history. You're right, Betty, I don't know of many set around St. Louis. I love Rett MacPherson's mysteries set just south of there, though they're contemporaries about the past rather than proper historicals. Nice to hear you went to EIU back then! The campus has changed a lot since :) It's changed a lot just in the eight years I've been here... hard to believe it's been that long.